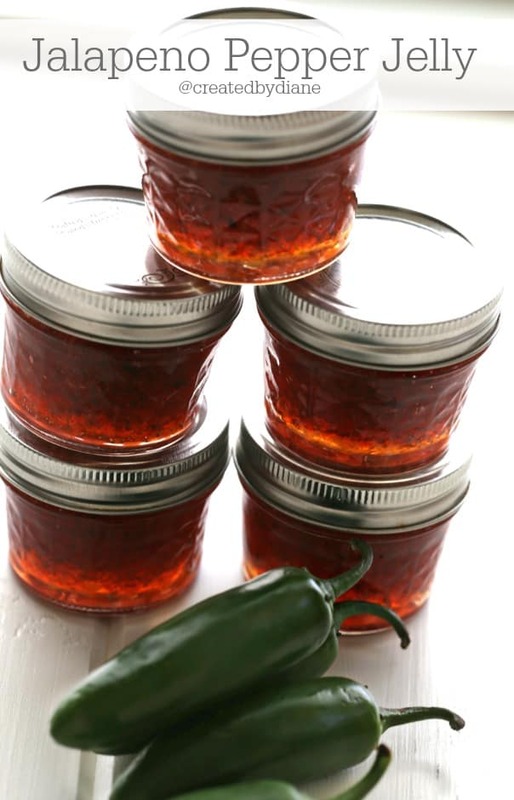 Spicy and SWEET is where it’s at today, with this jalapeño pepper jelly! If you visited my blog before then you may know I love jalapeños! They give recipes a great flavor with some heat, without making you RUN for the water fountain! There are a few times that I’ve purchased jalapeños and they are hotter than usual, and I’ve noticed those times the peppers don’t have a great flavor, they are just hot. But I’m happy to say for the most part where jalapeños are available near me, they are delicious. The recipes I make are not overly spicy, my kids eat them without any problems. The jalapeños just seem to add great flavor. 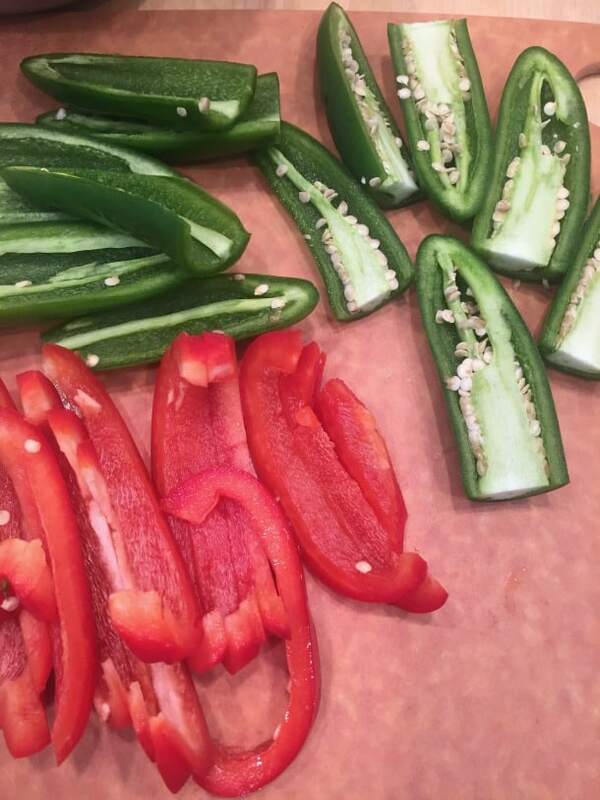 You will know the minute you cut into jalapeños if they are the SUPER-HOT type. 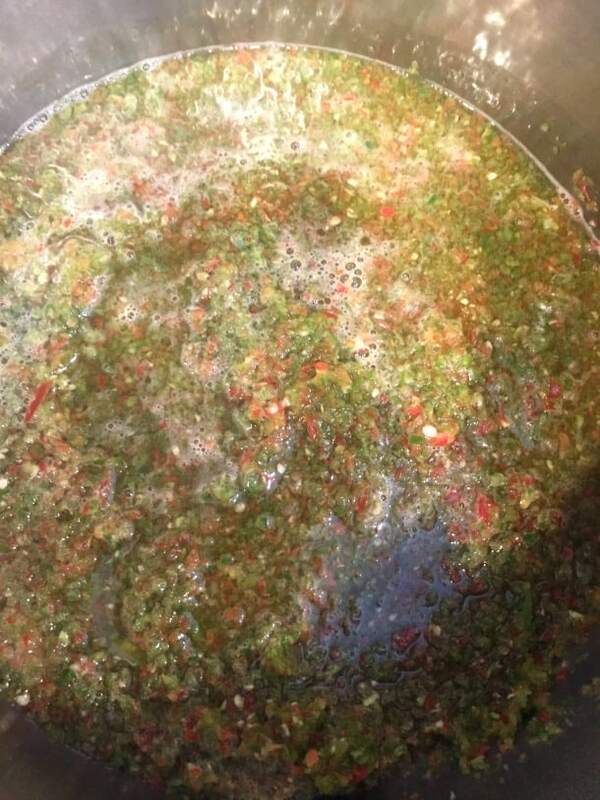 It’s not too difficult to lessen the heat, cut the jalapeños in half and remove the white rib along with the seeds. I don’t prefer really HOT….I’m more of a medium heat kind of person. So it will be easy for you to adjust any of my recipes to your preference. You can reduce the jalapenos used or leave the rib and seeds in if you like it spicier. Dice up the peppers and look how pretty those colors are! I diced them tiny, using a hand chopper. You can use a food processor too. I have NEVER canned anything before, if you haven’t either….this is a great way to start. I made small batch. 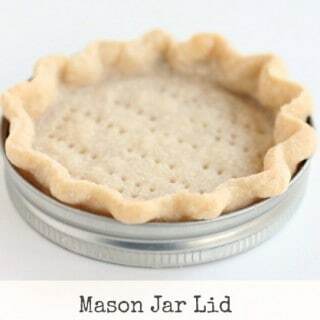 This recipe makes six 4 oz jars. I’ve seen people can items, but it never interested me until now. I wanted to make some jalapeño pepper jelly and have some in the coming months for a delicious appetizer I will be sharing with you soon. This was perfect for that. The 4 oz. jars are a great size to enjoy and not have a large jar sitting in the fridge just taking up space until you decide to use it again. 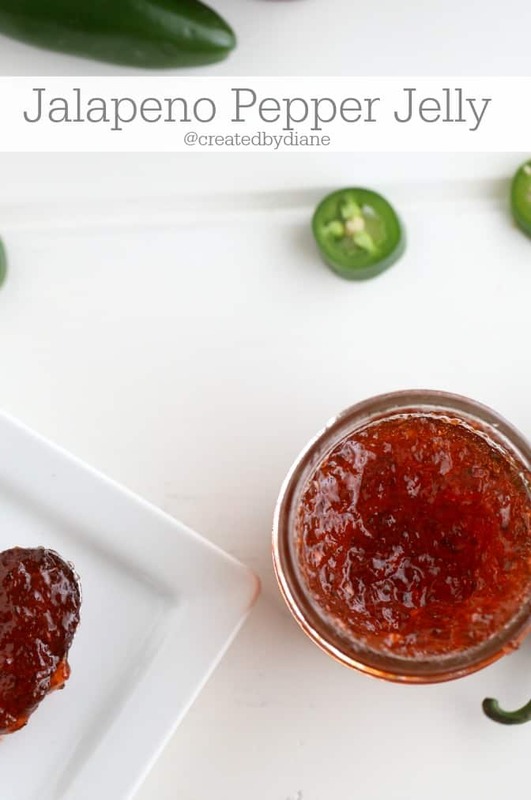 But if you LOVE jalapeño pepper jelly and will go through it you don’t need to boil it in the jars and seal them, you can simply refrigerate it and enjoy. That is one of the best things about this. You can choose what works for you best. I had plenty of takers who wanted a jar, and will be making more real soon! I’m sure I will be keeping a whole batch in the fridge, I love it that much. add lemon juice and sugar, bring to a boil for 10 minutes. add pectin and bring to a boil for one minute. Mix in a drop of red coloring if you like, I did. I wanted the jelly to have a pretty red color. In the notes I tell you how I canned the jelly. Alternatively you can place the jelly in jars and refrigerate it, especially if you will consume it within a reasonable amount of time. I used 4 oz liquid pectin, this made a thick jelly which is what I was looking for. If you prefer you jelly loose adding 2-3 oz of pectin would work. I'm no expert on the canning part. I followed the instructions on the Ball Canning Jars website. I cleaned and heated my jars. I made the jelly, then filled the jars leaving the ¼" they recommended, wiped the jars and applied the lid and bands to the jars. I then boiled them for 10 minutes. After they cooled I checked the seals and am happy to say they all worked out well. I wanted my jelly really thick, because I really like it heated up…and when jelly is heated it get thinner. If it’s still on the thick side just a couple drops of water will thin it out as it’s heated. I read up about canning and the different types of pectin and some people mentioned that they had issues with the pectin setting up, so I erred on the side of caution and wanted it thick and used 4 oz liquid pectin. You can certainly reduce the amount if you prefer it thinner and aren’t going to be heating it. Maybe you can all the time and have a favorite brand of pectin, if you do…let me know. I’d love to hear your tips! So yes it’s a jelly, but it’s also a great dip for appetizers, spread on bread or crackers with cream cheese or goat cheese. That certainly makes a delicious midnight snack! I’m hopelessly addicted to this stuff, and I love the color of yours! You can make it as mild as you like. The jalapeños are cooked, so you can do half and half with bell peppers if you prefer it really mild. We love pepper jellies of all sorts. 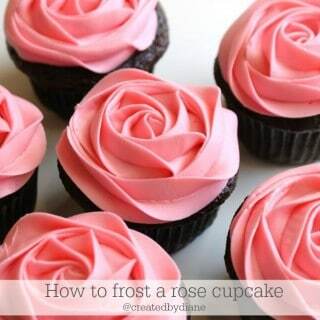 This one looks wonderful Diane! Pinning! 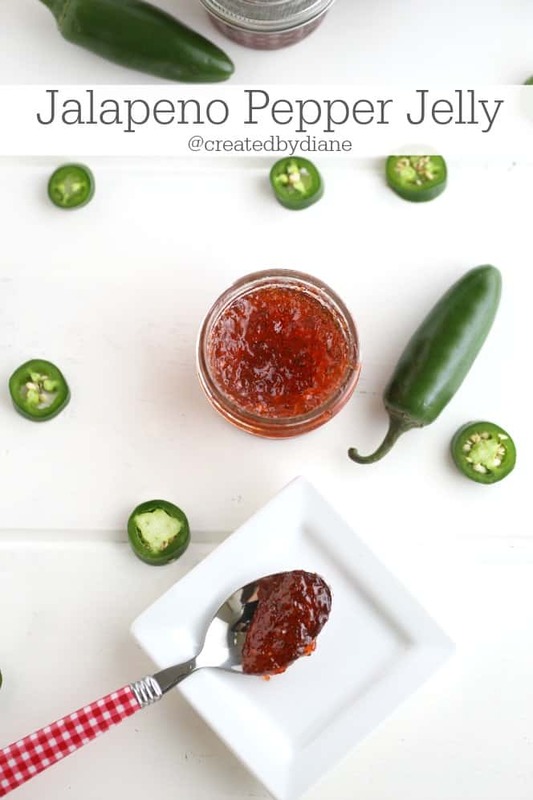 I love Jalapeno Jelly! It’s such a great addition to a cheese platter. Adding the red peppers is a great idea! Thank you for this great easy recipe! My husband said, ..” just like Christmas”, when he tasted it and continued to eat a half jar with Ritz crackers and cream cheese. Made 5 batches from our garden bounty of jalapenos. We cannot run out! Just Don’t forget the gloves! On the 2nd batch, I got smart and used a melon baller to clean the peppers and didn’t cut my gloves from then on. Happy to hear you and your husband liked it, it is hard to resist once you start eating it! sorry step 3 and 4 got switched. chop jalapenos, add them to the food processor to finely chop them. add vinegar, lemon juice, sugar. Bring to a boil and boil for 10 minutes.Then add pectin and boil for 1 minute. Then add food coloring, and place in jars. We cannot run out! Just Don’t forget the gloves! add them to the food processor to finely chop them. add vinegar.do you boil it with the vinegar? yes the peppers with vinegar get added to the lemon juice and sugar and get boiled together. I can’t eat spicy things but my family loves it so that I will try this recipe for my family! Thanks for sharing it! It’s snowing now and this dish really helps to warm ourselves very much!